By now, most of us have heard that getting insufficient sleep can cause weight gain, likely due to the increase in stress hormones. New research also shows that lack of sleep harms the immune system and trigger an inflammatory response. Below are two different perspectives on the same issue. First up is a video of a talk from Sean P.A. Drummond, PhD, director of the Behavioral Sleep Medicine Program and Cognitive Behavioral Interventions Program in the VA San Diego Healthcare System on how insufficient sleep is damaging to our health. Below that is a research review of a new article from PLOS ONE on the ways insufficient sleep harms not only our metabolic system, but also damages our immune system and causes inflammation (linked to nearly all diseases). University of Helsinki researchers have now shown what kinds of biological mechanisms related to sleep loss affect the immune system and trigger an inflammatory response. They identified the genes which are most susceptible to sleep deprivation and examined whether these genes are involved in the regulation of the immune system. The study was published in the journal PLOS ONE on 23 October 2013. Conducted at the sleep laboratory of the Finnish Institute of Occupational Health, the study restricted the amount of sleep of a group of healthy young men to four hours per night for five days, imitating the schedule of a normal working week. Blood samples were taken before and after the sleep deprivation test. White blood cells were isolated from the samples, and the expression of all genes at the time of the sampling was examined using microarrays. The results were compared with samples from healthy men of comparable age who had been sleeping eight hours per night for the week. "We compared the gene expression before and after the sleep deprivation period, and focused on the genes whose behaviour was most strongly altered," explains researcher Vilma Aho. "The expression of many genes and gene pathways related to the functions of the immune system was increased during the sleep deprivation. There was an increase in activity of B cells which are responsible for producing antigens that contribute to the body's defensive reactions, but also to allergic reactions and asthma. This may explain the previous observations of increased asthmatic symptoms in a state of sleep deprivation." The researchers also wanted to examine the impact that long-term sleep deprivation could have on the immune system. For this follow-up study, they used material from the national FINRISKI health survey. Participants in this population study underwent blood tests but also answered questions about their health, for example whether they were getting enough sleep. The researchers compared participants who believed they were sleeping sufficiently with those who felt that they were not sleeping enough. Some of the gene-level changes observed in the experimental working week sleep restriction study were repeated in the population sample. These results may help explain the connection between shorter sleep and the development of inflammatory diseases, such as cardiovascular disease and diabetes, which has been established in epidemiological studies. "These results corroborate the idea that sleep does not only impact brain function, but also interacts with our immune system and metabolism. 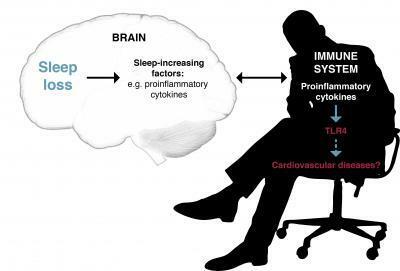 Sleep loss causes changes to the system that regulates our immune defence. Some of these changes appear to be long-term, and may contribute to the development of diseases that have been linked to sleep deprivation in epidemiological research," Aho states. Epidemiological studies have shown that short or insufficient sleep is associated with increased risk for metabolic diseases and mortality. To elucidate mechanisms behind this connection, we aimed to identify genes and pathways affected by experimentally induced, partial sleep restriction and to verify their connection to insufficient sleep at population level. The experimental design simulated sleep restriction during a working week: sleep of healthy men (N = 9) was restricted to 4 h/night for five nights. The control subjects (N = 4) spent 8 h/night in bed. Leukocyte RNA expression was analyzed at baseline, after sleep restriction, and after recovery using whole genome microarrays complemented with pathway and transcription factor analysis. Expression levels of the ten most up-regulated and ten most down-regulated transcripts were correlated with subjective assessment of insufficient sleep in a population cohort (N = 472). Experimental sleep restriction altered the expression of 117 genes. Eight of the 25 most up-regulated transcripts were related to immune function. Accordingly, fifteen of the 25 most up-regulated Gene Ontology pathways were also related to immune function, including those for B cell activation, interleukin 8 production, and NF-κB signaling (P<0.005). Of the ten most up-regulated genes, expression of STX16 correlated negatively with self-reported insufficient sleep in a population sample, while three other genes showed tendency for positive correlation. Of the ten most down-regulated genes, TBX21 and LGR6 correlated negatively and TGFBR3 positively with insufficient sleep. Partial sleep restriction affects the regulation of signaling pathways related to the immune system. Some of these changes appear to be long-lasting and may at least partly explain how prolonged sleep restriction can contribute to inflammation-associated pathological states, such as cardiometabolic diseases.